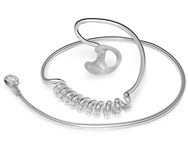 In-ear earphones or headphones, also referred to as isolation earphones, and musician monitors, have nearly taken over the music listening marketplace. Offering portability, easy storage, isolation from surrounding noise and extraordinary sound quality, in-ear listening devices represent a ground-breaking trend in high fidelity music enjoyment for music lovers. Professional musicians enjoy all these benefits in the monitors they wear on stage, plus their monitors are custom made to fit them perfectly. And while full custom musician's monitors are available to anyone, their prices can be prohibitive for casual music fans. 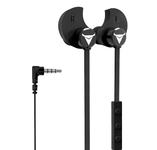 Isolation earphones usually come with replaceable ear tips in several sizes. If you are one of the 20% or so of users who cannot get a good fit from the included tips, you may need custom molds for your earphones. For you, we offer a number of add-on custom molded ear tips you can use to make your off-the-shelf in-ear earphones or other earpieces fit as well as the full custom molded in-ear monitors used by the stars. 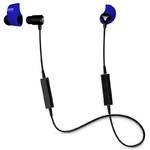 Decibullz Custom-Fit Bluetooth Earphones let you make your own custom molded earphone earpieces at home. The process is easy, mess-free, and takes just five minutes. Re-moldable so you can try until you get the perfect fit. Bluetooth wireless audio streaming. In-line mic and button controls for call and talk. Decibullz Contour ES headphones let you make your own custom molded earpieces, for an excellent fit and superior noise isolation. The custom molding process is easy and only takes about five minutes. These are the only re-moldable ear plugs: if you don't like the fit, you can heat them back up and try again. 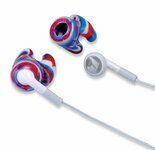 Decibullz Contour DIY Custom Earphones provide everything you need to quickly and easily create your own custom molded earphones at home. Their cost is a fraction of what you'd pay for professional custom molded earphones, and the process is quick, clean, safe, and easy. Only takes about 15 minutes. These are replacement thermoset molds for the Decibullz Contour Earphones. These replacement molds are just like those that come in the original Decibullz Contour Custom Earphones package. Custom molded replacement tips fit everyone perfectly, because each set is made from impressions taken of your unique ears. Custom molded tips last many times as long as typical replacement tips, saving you money over time. Custom molded tips are simply more comfortable. 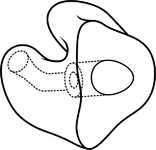 Ordinary replacement tips all apply pressure to the ear canal in order to create a seal (which is critical to accurate sound and adequate isolation,) while custom molded tips fit precisely into the canal without applying pressure to the canal walls. 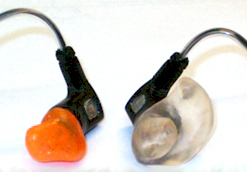 Custom molded tips are available for all in-ear earphones, including those with unusual profiles which limit the available ordinary tip options. 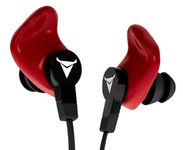 Custom molded tips improve the quality of sound you hear from your in-ear earphones. Even when you get a comfortable fit from ordinary ear tips, we have found that many so not get a perfect seal. With even the tiniest opening between the ear canal wall and the tip, the bass response of your earphones can be dramatically reduced, resulting in the tinny, unsatisfying sound you may now be experiencing from your expensive in-ear earphones.